Astrophotographers use long exposure times and long focal lengths. 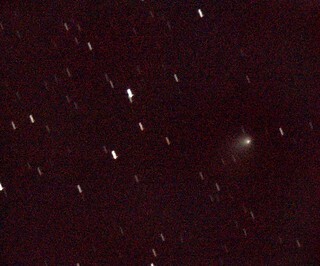 The image to the left of a faint comet is a stacked composite of twenty exposures. Each individual exposure, or ‘frame’, was fifteen seconds long, through a 1260mm lens. To give an idea of what this means, the entire image is perhaps a tenth of the size of the full moon. And to drive the point home further, the full moon is the same size as your thumbnail held at arm’s length (Try this at home tonight, if you have any doubts). In common language, we are zooming in a huge amount, and that means even the tiniest movement of the camera gets amplified enormously. The rig I used to capture that image (Canon DSLR with a telescope serving as the 1260mm f/6.3 lens) weighs more than five kilograms, which makes it simply too heavy for a simple camera tripod. Instead, I built an observing pier by planting a section of telephone pole in my garden, bedded into about half a cubic meter of concrete, and fixed the mount head to the top. Now this rig, heavy as it seems, is not immune to vibration. Simply touching the camera causes enough vibration that the stars immediately smear out into streaks and stay that way for about three seconds till the vibrations damp out. If somebody merely walks past, their footsteps show up clearly as a shuddering in the view-finder. Even the camera strap, swinging like a pendulum, is enough to sway the view from side to side. A moderate gust of wind is a disaster, rendering my entire system unuseable until the wind settles again. Professionally built mounts do not have these problems, but they are very large, heavy, and expensive. But if all you have is a simple camera tripod, do not despair. By keeping your camera light and not using such extreme focal lengths, the vibrations described above become far less obvious. I’ve had good results using a particularly cheap tripod with a 55mm lens (the same one that was bundled with the camera when I bought it) by setting it up on the lawn away from the house, on a windless evening. A bad mount doesn’t prevent you from doing astrophotography. It simply restricts your options and places an upper limit on the quality of the images you can capture. As you hopefully know, the Earth is round and it rotates on its axis. Standing on the surface, we cannot feel this rotation but we do see the entire sky appear to rotate above us in the opposite direction. This means that everything outside our atmosphere – the Sun, Moon, stars and planets – all rise in the East and set in the West. This motion is too slow for us to detect with out eyes, and we can only detet it by noting the position of an object, then checking again an hour or more later. But if we magnify our view, with a telescope, then the rate of motion becomes magnified too. At high magnifications, a star can move through our field of view in seconds. If we’re just looking, it is possible to make constant adjustments to keep it in view, but when taking long exposure photographs that is no longer an option. Instead, we need a mechanical system to constantly and smoothly move the telescope in such a way as to exactly counter the Earth’s rotation. The only way to do this is with an equatorial mount. Equatorial mounts are arranged so that one axis of movement is exactly parallel with the Earth’s axis. Then, once the target is acquired, an electric motor turns that axis at a rate of exactly one revolution every twenty three hours and fifty six seconds. Getting this set up correctly is not a simple task, however. If the alignment isn’t perfect, the telescope will slowly drift off target, smearing the stars into streaks even with relatively short exposures. And any imperfection in the drive mechanism (and even the best engineered parts fall short of perfection) will result in periodic errors where the telescope alternately moves too fast and too slow, causing it to drift slightly ahead of the target, then behind it. A badly designed mechanism might be prone to tiny vibrations, and an insufficiently rigid mount can also transfer outside forces to the telescope, adding to the unwanted movement. As you can see, problems with the mount can cause a huge range of problems with your images. For this reason, if you have some money to spend on an astrophotography rig and aren’t sure how to spend it, buy the biggest, heaviest and most well engineered mount you can find. Incidentally, many mounts today are computerised. This is a very good thing, especially if the onboard system can be controlled by an external computer as this allows you to run a guidescope, and control the telescope without touching it. But make sure that it is an equatorial mount – most computerised mounts have an Alt-Azimuth configuration. This has the benefit of being stable, easy to set up and cheap to manufacture, but it is not desirable for astrophotography. The reason is that, while the computer can move it to keep an object in sight, it does so in a way that doesn’t match the objects actual movement through the sky, causing the view to rotate over time. This is find if you’re looking through an eyepiece, but a big problem for potography. The effect might not be too bad for relatively short exposures, but those really long, deep images will not be possible. Regardless of how much money was spent, no mount is perfect. Tiny imperfections in the gearing cause periodic error, and even the best polar alignment will still be off by some tiny fraction of a degree. And then there are external problems, such as atmospheric refraction causing an object’s position to appear slightly higher than it is as it gets closer to the horizon, or even the actual proper motion of the object itself (in the case of the Moon, asteroids and comets). The result is that even the very best tracking can never keep an object perfectly stationary in the field of view. The solution is guiding. In the old days, a mount would be fitted with motors on each axis which the operator could use to make fine adjustments to the telescope’s position. They would then sit with their eye glued to the finder scope for the duration of the shot, carefully guiding the telescope by hand to keep the target exactly in the cross-hairs. It must have been hell! Today, we let computers do the hard work. First, we add a guide-scope to the rig – a small telescope with a dedicated camera permanently attached, that is attached to the main optical tube alongside the traditional finderscope. The guidescope’s camera, and the mount’s onboard computer, is connected to a laptop, and its input fed to the telescope control software. This program then does exactly what the old-time human used to do: keep an unblinking eye on the image and constantly make micro-adjustments to keep the view absolutely static. Now, computers don’t get bored, or tired, and they never have to rest their sore eyes, so they can do a much better job of guiding a telescope than any human. The downside is that you end up with an awful lot of wiring running up and down, between mount, camera, guidescope, autofocuser, laptop, and power pack to keep it all running. This needs to be carefully strapped in such a way that nobody can trip over any of it in the dark, the wind can’t catch it and set it swinging (another cause of vibrations! ), and scariest of all, that it won’t slowly pull tight and eventually break as the telescope follows a target all the way to the horizon.